This beer style was created in the mid-1750’s. A dark full-flavoured beer but smoother and less bitter than stout. 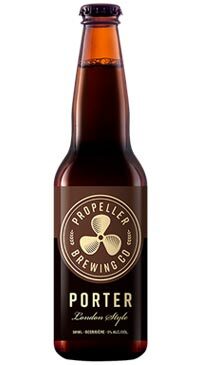 Made with softened water, Propeller London Porter is a blend of pale, roasted and chocolate malts, hopped with English and North American varieties. Porter was the drink of the masses long before lagers or modern ales were fashionable. The name Porter originated because this strong, nourishing drink was reputed to be the favourite beverage of the hard working porters of London’s Covent Gardens.